“When you’re real, you don’t mind being hurt.” This central theme permeates an affable and vibrant staging of Margery Williams’ timeless book “The Velveteen Rabbit, ” which opens KidSeries’ twenty-eighth season at Rogers Park’s Lifeline Theatre. The classic tale of toys’ secret lives (some seventy-odd years before Buzz Lightyear) is adapted for the stage by ensemble member Elise Kauzlaric and brought to bright life by Jamie Cahill as the floppy and progressively more existent Rabbit, her peaches and cream face an ideal projection of naïve emergence. 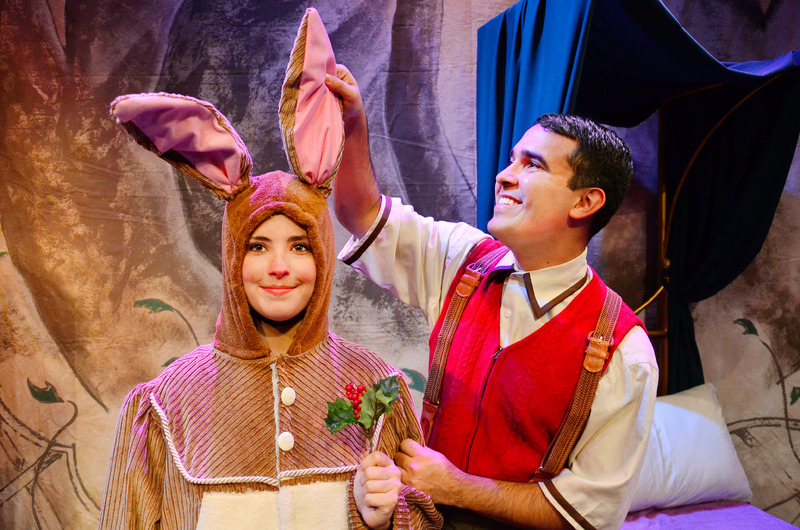 Christopher Acevedo, as the rabbit’s young keeper and caretaker, is a sweetly blank canvas for the young audience’s fantasies. When the boy’s unconditional love for the rabbit gives way to the Scarlet Fever that will condemn her to the woodpile, Acevedo’s performance is never inappropriately worrisome, although the thematic content— and need for subtle understatement—is better suited for an audience closer to five rather than younger. Cahill’s breezy performance hits its stride in the fantasy segments, only alluded to in the original text. Mykele Callicutt, as the rabbit’s toy-world guide Skin Horse, is a standout, a toy-box oracle whose hooved-crutch costume is all whimsically melancholic, a sweet allusion to his advanced position. Skin Horse’s navigation of the Rabbit through the process of becoming real provides the thematic meat of the story, although even its clearest passages are sure to fly over the heads of the younger audience members. Once prized possessions, the Toy Soldier and Model Boat are played with ample physical possession and witty insecurity by Jenna Schoppe and Danielle Davis, respectively. The invented toy battle scene was a particular audience favorite on opening day, as director Amanda Link had the entire cast lurching and leaping across the stage. At Lifeline Theatre, 6912 North Glenwood, (773)761-4477, lifelinetheatre.com. Saturdays and Sundays at 11am and 1pm. $15. Through November 23.